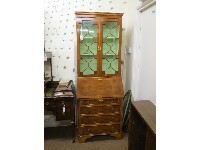 A Jaycee golden pine bureau, panelled fall-front enclosing fittings, two short and three long drawers beneath, 2ft. 10in. 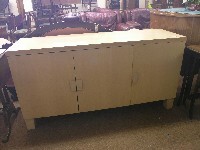 A Kesterport light beech sideboard, shelves and cutlery drawer enclosed by three doors, 5ft. 2in. A Victorian painted pine chest, two short and two long drawers, turned feet, 3ft. 6in. An Heal & Son Ltd. limed oak bedroom pair, wardrobe enclosed by three panelled doors, 5ft., chest of three drawers, 2ft. 6in. 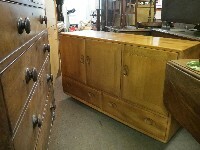 An Ercol golden elm sideboard, three panelled cupboard doors above two drawers, on casters, 4ft. 3in. 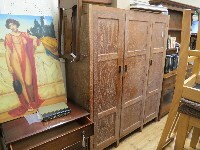 A dark oak corner cabinet, floor-standing, pair of leaded glazed doors enclosing two shelves, panelled cupboard base, 5ft. 10in. 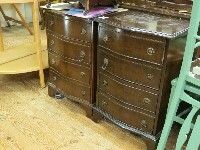 A reproduction mahogany bureau, enclosed fittings above four long drawers, bracket feet, 2ft. 6in. A Victorian stripped pine chest, two short and three long drawers, turned wood knob handles, 3ft. 4in. 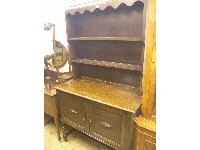 A dark oak Welsh dresser, plate rack above cupboard base, 3ft. 6in. 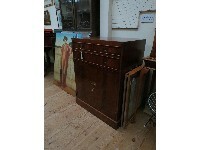 An early 20th century painted oak chest, two short and two long drawers, embossed brass handles, 3ft. 6in. An E. G. Hudson yew-veneered bookcase, pair of lancet-glazed doors enclosing three adjustable shelves, arrangement of five short drawers beneath, on splay feet, 2ft. 11in. 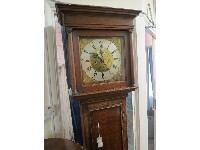 An E. G. Hudson yew-veneered bookcase, pair of astragal-glazed doors enclosing two adjustable shelves, 2ft. 4in. 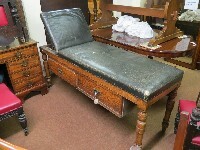 A pair of E. G. Hudson yew-veneered centre tables, square-shape, one with inset gilt-tooled leather top, the other polished, 2ft. 8in. An E. G. Hudson burr walnut chest, eight side-by-side drawers, cross-banded throughout, on bracket feet, 3ft. 11in. A dark oak bar-fitting, panelled construction with interior shelving, 3ft. 6in. x 3ft. A late Victorian satin-walnut dressing chest, adjustable mirror and part-marble top above an arrangement of drawers and cupboard, on casters, 4ft. A Victorian cast iron fire-grate, white-painted, mantel 2ft. 5in. 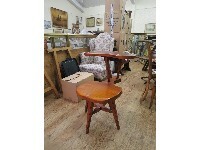 A dark oak dining table, rectangular-shape on turned beech underframe with H-stretcher, top 4ft. x 2ft. 8in. A reproduction mahogany desk, inset gilt-tooled leather top above three frieze drawers, further drawers to each pedestal, 4ft. A Georgian-style mahogany dining table, with extra leaf, on twin pedestal stems with casters, 6ft. opening to 8ft. A French-style nest of three tables, with simulated marquetry, and a mahogany cupboard with simulated drawer fronts, 1ft. 6in.